The obsession with toy figures has never been more spirited than it is with Hello Kitty, the Tokyo-born and London-bred kitten with no mouth. Wearing a signature bow near its left ear, Kitty's likeness has appeared on every conceivable retail item: from clothes, bags, shoes, and jewelry to pillows, towels, phones, compact disc players, electric guitars, etc. Not only that – this fab feline has also been linked to a great number of celebs. Mariah Carey, Cameron Diaz, Heidi Klum, Steven Tyler, Christina Aguilera, Carmen Electra, Mandy Moore, Ricky Martin, Britney Spears, Lisa Loeb, and Nicky Hilton have all been spotted sporting Hello Kitty goods. (Above, right) The pink Hello Kitty Be@rbrick is part of Series 9. Impossibly cute and pink almost to the point of kitsch, it's a cult classic, a definite must-have. Just like that purr-y purse is to Paris Hilton (left). Great blog! The photos all look great! You really put a lot of thought into the composition of the photos and content. Makes me want to go buy some bearbricks myself! 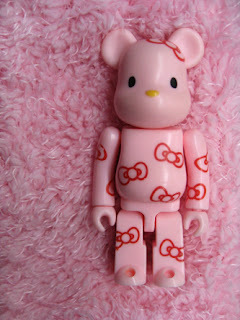 I especially liked the hello kitty, jelly and animal bearbricks. what's so scary about the scarygirl be@rbrick? stick your tongue out, be@rbrick!